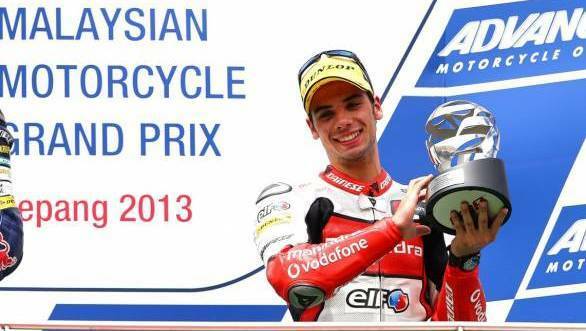 Miguel Oliveira helped Mahindra Racing make history at Sepang. The 18-year old Mahindra Racing rider might have started the race from the second row, and got off to a fairly troubled start, bogging down at the start and ending the first lap down in 14th. However, soon after, he began carving his way through the grid, managing even to set a new lap record for Moto3 at Sepang. By the halfway mark of the race, Miguel had moved up to fourth on the grid and looked like he was all set to go one better. But with each passing corner, the positions changed. Eventually, though, the Mahindra Racing rider managed to climb into third place and stayed right there - he finished just 0.408 seconds behind race winner Luis Salom. Separating the first six was a gap of just one single second. 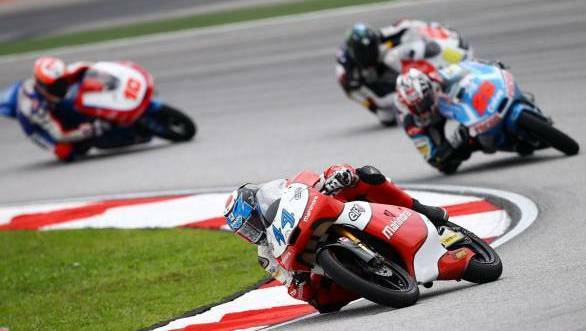 This is the first time Mahindra Racing has claimed a podium in the Moto3 class. "After the start I made I didn't expect the podium! I knew I could do it, but I had to recover a lot of time, and take a lot of risks in the first laps, in the braking areas and also with corner speed," said a very happy Oliveira of his achievement. "Now the next goal: we look forward to winning grand prix races," was what team principal, Mufaddal Choonia had to say.